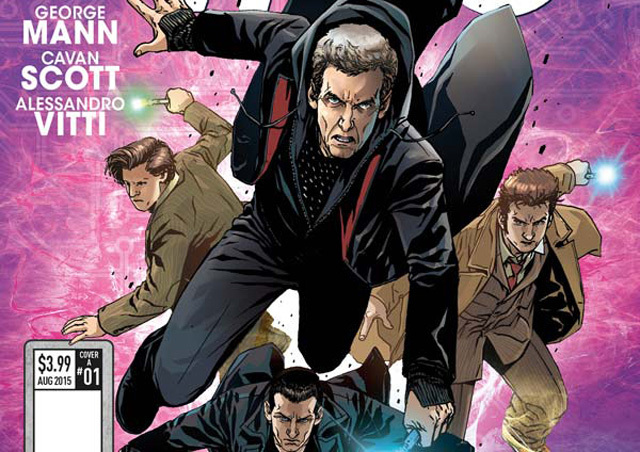 Titan Comics: FOUR DOCTORS – Supremacy of the Cybermen #1 Review | Warped Factor - Words in the Key of Geek. Tony will become like us. Last year’s Four Doctors ‘Event’ comic-book sequence undoubtedly lived up to its billing, with Paul Cornell on writing duties and Neil Edwards on artwork, plunging fans back into the timelines of the 21st century Doctors to deliver a story that was twisted, mad and glorious. This year’s event comic-book series has scripting by George Mann and Cavan Scott and is called Supremacy of the Cybermen. Strap in, folks, mad and glorious just got real. The thing about choosing a title like that is that the weight of TV history is so very much against you. Bless them, the Cybermen have such a combination of philosophical gravitas and visual flair, they’re impossible not to love and fear, but the stories in which they’ve starred have been, almost without exception…a bit dodgy. Even the great ones don’t bear too much scrutiny – The Tenth Planet introduces the creepy machine men, but they do, sort of, die halfway through and have to send for reinforcements. Earthshock really has no logic to it at all, as they’re due to sacrifice a whole cargo-hold full of freshly minted Cybermen just on the off-chance that any survivors will be able to mop up any humans left alive on Earth. Tomb of the Cybermen is essentially the equivalent of getting up when your Cyber-alarm clock goes off, then thinking better of it and going back to bed for ‘just another five minutes,’ so you can get up again later on. And if someone can explain the thought-processes behind The Wheel In Space to me, I’ll give them a Cyber-enhanced KitKat. What’s perhaps more is that previously, when the Cybermen have appeared in the title of stories, they’ve still been a bit of a let-down. The Revenge in Revenge of the Cybermen is both linguistically and factually questionable. And there isn’t really any Attack in Attack of the Cybermen – except, perversely, the attack on them, rather than of them. The point of all this is two-fold. Firstly, the Cybermen are due a really, really big win. They’re due some love, and some logic, and a story that is really worthy of the phenomenal concept they embody. And secondly, at this point in the show’s history, if you nail your colours so boldly to the mast as to call your story Supremacy of the Cybermen, you’d better make damn sure they’re actually bloomin’ supreme. Not supreme-ish, not sneaking up on supremacy by poisoning everybody on a space station a gazillion miles away. Proper, ultimate, doing-what-it-says-on-the-tin su-bloomin’-premacy is what we’re looking for and what we’re expecting. We are to be fobbed off with nothing less. Having said all that, how excited would you be if we told you that Mann and Scott deliver supremacy within the course of issue #1? 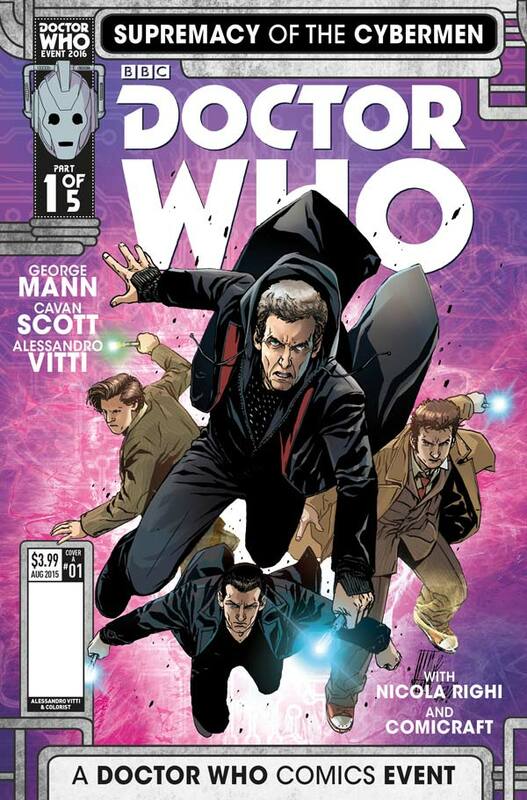 As with last year’s event comic, we’re looking at four separate Doctors, and this time, with the Ninth Doctor properly embedded in his own comic-book series, they can be relatively uncomplicated – Doctors Nine, Ten, Eleven and Twelve are each in their own proper timeline, and as has become a matter of respect from Titan, they go out of their way to tell us exactly where in the timeline each Doctor is (that’s a company that understands the nature of the geek heart!). In this first issue, the Tenth Doctor, Gabby and Cindy encounter both ‘a big old space-bus’ and a squad of Sontarans, the Eleventh Doctor and Alice on prehistoric Earth encounter a hunting party of be-masked Silurians (an effective visual touch – they have a far more sinister look in their masks than out of them), the Twelfth Doctor crash lands on Karn, talks to Ohila and finds his way back once more to post-Hell Bent Gallifrey (Oh yes, people, we’re moving on), and the Ninth Doctor, Rose and Jack encounter your actual Cybermen (a first for the Eccleston Doctor) on the Powell estate, things getting more than a little Ghostbusterish, and introducing the irrepressible force that is Jackie Tyler to the comic-book world. Sontarans, Sisterhoods, Silurians, Cybermen and Time Lords, plus four Doctors, in the space of one issue. That in itself would be enough to qualify the issue as a blistering success – not to mention almost ridiculous value for money. But each of the threads builds to a point, and each of the points makes you gasp, and each of those points in turn leads you to the cliffhanger, and one word throbs through each of the points and the cliffhanger, and yes, that word is ‘Supremacy.’ From the first issue, what comes through most of all is the scale of the imagination at work here. Most fans will at some point in their lives have thought of at least one movie-length, epic Cyber-story, shaking off the shackles of the race’s TV history and the restraints of physical possibility and effects budgets, and had the Cybermen conquer the universe of space-time. They’ve always been uniform, a single shape and size, but we’ve all in our heads imagined weird hybrids – Cyber-Daleks and Cyber-Silurians. Cavan Scott and George Mann have had those dreams too, and right here and right now, they’re laying out their imaginations of what a true Cyber-conquest of the universe might look like. In terms of the look and feel of the thing, we’re in the hands of Alessandro Vitti and Ivan Rodriguez, with a little help from Tazio Bettin on one of the more impressive standalone pages that advances the storytelling significantly. Maybe this is just a function of having gotten used to a fairly regular stable of Who artists, but there’s a different visual vibe to this issue than you’ll find in most Titan Who comic-books. In fact, there’s a riff on the IDW comic-books here, the aliens being highly recognisable – the SIlurians look particularly impressive in this issue – but with less rigorously exact attention being given to some of the human characters. As has been an issue with new artists since he made his debut in Titan, the Tenth Doctor’s particular facial lines and mannerisms appear to be especially difficult for the new artists to master, meaning he sometimes looks like a David Tennant cosplayer, rather than David Tennant himself. As we go up the Doctors though, the likenesses get more and more en pointe, with Capaldi’s Twelfth Doctor being impossible to mistake for anyone else. While the visuals may take a little while to settle down, and in the meantime make you remember the relative precision of Neil Edwards, the scale of the storytelling here carries you through, and a handful of panels and pages that are absolutely dead-on give the first issue some strand cliff-hangers that make you take sharp intakes of breath and set your watch for the next instalment. Scott and Mann have conjured with the kind of fan-dream you need a series finale to deliver on-screen, and by the end of issue #1, make you breathless for the next stage in the drama – most especially as the first issue ends on a post-Hell Bent visual that makes a terrifying amount of sense in context – trust us, when you see it, you’ll squeal. Supremacy of the Cybermen, issue #1 is many a fan-dream come true. Buckle up, Who-fans, you’re going to want to ride this story all the way to the end.